Gone are the days of a lady standing on the back of a horse much to the delight of audiences. 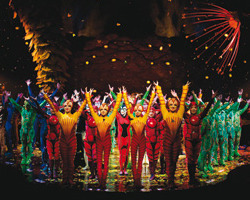 Cirque Du Soleil changed the way we view the circus forever. Although the circus tent still exists, it is now named the Grand Chapiteau (Big Top). From their smoking hot live bands, to the artists that perform the seemingly impossible, there's not a person who has to these shows that hasn't been amazed. A fabulous event suitable for the entire family, babes under two are free on a parents lap; no need for sitters, take the whole family. 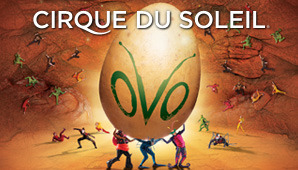 Cirque du Soleil is returning to Australia in 2012-2013 with a spectacular new show - OVO. 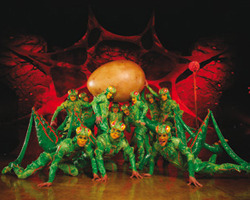 It is an amazing adventure that draws the audience into a colourful eco-system filled with life. The artists take on the forms of insects amazing us with how they work, eat, crawl, flutter, play, fight and look for love. This new show features great music, gravity defying acts and an inspiring mix of movement, colour and sound. Allow the insects to invite you into their home filled with beauty, noise and touching moments of emotion. The journey commences when a strange egg appears. Always curious, the insects fascinated by this object, which represents the enigma and cycles of their lives. On a heartfelt note, and perhaps one many of us can relate to, a strange quirky insect arrives and is enthralled by the amazing ladybug. She is equally intrigued by him. Never to be a light show, Ovo promises 54 performing artists arriving from 16 countries. Their acts include a flying trapeze act, with six flyers reaching heights of 40 feet in the air, Banquine, Russian swing and swinging chair. In a breathtaking finale we are treated to 20 artists running, jumping and leaping up a 24-foot vertical wall. I saw Ovo in Washington D.C. in 2010 and it blew my mind! Highly recommended!